A few weeks ago we shared with you a resource full of tips and practical ideas to help teachers make the best of Google Forms in their instruction. Today we are sharing with you another equally important resource from the same source: @Google for Education. This is basically a collection of tips and best practices for using Classroom in your teaching. These are all tried and tested ways on how to utilize Google Classroom with your students as shared by teachers from all around the world. You can also take part in this EdTech conversation around Classroom and share your thoughts about features you are using or have found useful in your instruction by filling out this form. 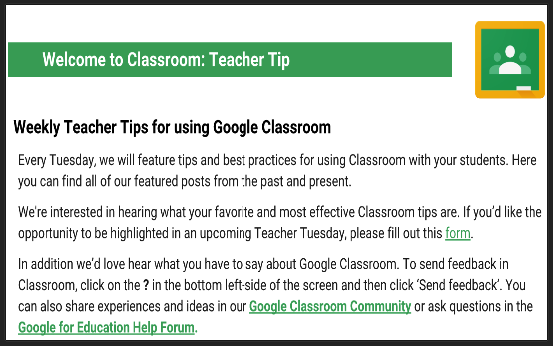 Some of the Classroom tips you will get to learn from this resource include :how to create Escape the Room activities in Classroom, how to create literature groups in Classroom, how to gamify your classroom, suggested ideas on using Classroom in your music class, learn about spelling tests in Google Classroom, how to use hyperdocs in Classroom, how to use Classroom for collaborative writing projects, discover how students can create their own portfolios in Classroom, how to use Google Classroom in preparation for the holiday break and many more. You may want to spend some time going through all the tips there and we are pretty sure you will learn tons of new ways to effectively tap into the educational potential of Classroom.